If there is one thing that we Jamaicans can be counted on, it is to enjoy the fact that we have the world's greatest sprint factory. What many don't know is that a major factor in our success is the intense rivalry that exists among our high schools, that starts at age 11 and continues for a lifetime. I remember vividly sitting at a lunch-table in my college dorm in the <?xml:namespace prefix = st1 ns = "urn:schemas-microsoft-com:office:smarttags" />U.S as a teenager, listening to my American friends from around the continent talk about how much they hated high school. I was amazed, for as far as I was concerned, my days at Wolmers Boys School in Kingston from 1977-1984 were the bet part of my life up to that point. What was more important was the sense of pride I felt at belonging to a fine institution with a 250-plus year history. Wearing a uniform meant that I represented the school on any given school day, to the Jamaican public. Wearing the badges that showed the student offices I held only upped the obligation to be the best example I could be to those who had the "misfortune" to attend other schools. Back then, as today, that pride translates into a rivalry with all other high schools that produces world-leading performance in track and field, and the occasional angry confrontation, and even fights. A Jamaican child who reaches the age of 11 is quite conscious of which high school they would like to attend, and the privilege of getting their choice. At that age, all students in the public school system sit an exam to enter the high school system. They make a list of their preferences in rank order and the result is quite simple - the best performers receive their first choices while the worst performers receive no further education. The stakes are therefore quite high. The results are made public, and the pride that one feels in getting into a good school begins the lifelong association with the high school they attend. This all helps to make our high school athletes run faster. The rivalry comes to a head when each high school in Jamaica competes in Boys and Girls Championships - a four day track and field-only event held in Kingston each year. The competition showcases the best of the island's talent, filling a stadium of 30,000 with people of all ages, most of whom are sporting the colours of the high school of their choice. For a handful, a top performance at "Champs" will lead to scholarships and opportunities. For others, it will mean popularity, local success and the admiration of thousands. For all, it's a chance to do their best in a competition that is unlike anything else of its kind in the world. Asafa Powell, Usain Bolt, Veronica Campbell-Brown, and the rest are all products of this system, which produces far more quality athletes per capita than any other comparable programme in the world. As we look back at the just concluded Olympics Games in Beijing, I expect people to be wondering how a small country with very limited resources can be so successful in producing quality athletes. 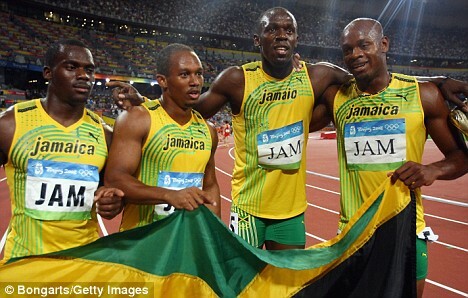 It's not in the yam or in the chicken nuggets, as some of the Jamaican stars would suggest, it's in our high schools. Francis Wade is a writer and management consultant based in Kingston, Jamaica. His passion is the transformation of Caribbean workplaces, economies and society. He blogs at Chronicles From a Caribbean Cubicle.